When we bought our house we had no idea what to do with one specific room of it. It was a large room that the previous owners were using as a media room but we “live” downstairs so that felt off to us. So for the first year and a half Andrew used it as his office and the general catch all room for everything. We inherited a workout bike from Andrew’s parents and threw some small weights, a yoga mat, and TV in there and it became half “gym.” We always knew when we had a baby we would want to use the majority of it for a playroom, but the other part of it for a workout area. We also wanted to have the rooms work together easily so baby boy could be playing while one or both of us got in a workout. Even though I have a gym membership it’s unlikely I will be able to make it daily, but I don’t want to use that as an excuse. 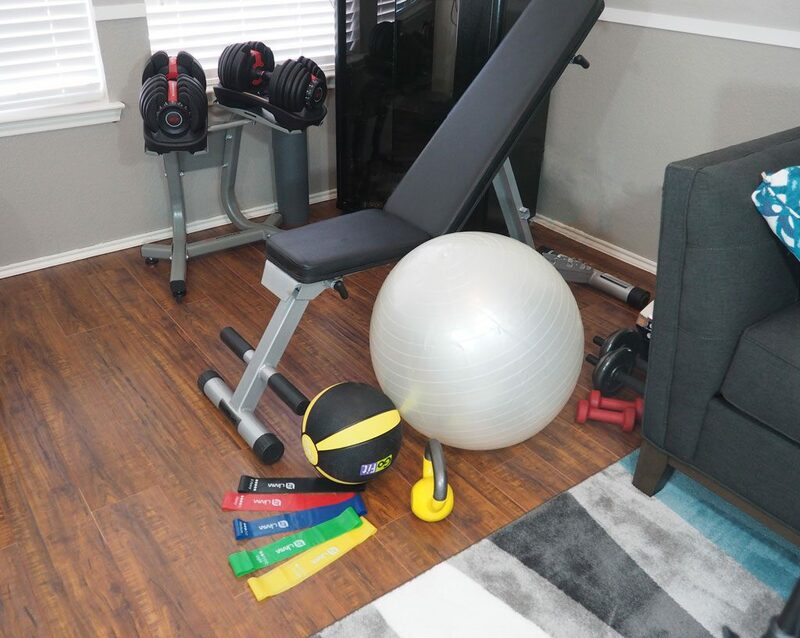 I am partnering with Nebraska Furniture Mart to show you how to create a home gym for under $500! I knew I wanted a really really good set of free weights and a bench. For most of my strength training at the gym I use my body weight or free weights and a bench. I use the bench not just for weights but for lunges and step ups as well. So the bench had many purposes. The free weights are more than I will ever need so I loved that you could get so many different weights from one set. While they are a bit of a splurge item, they are worth it. Resistance bands are amazing for doing leg workouts. I use them with my trainer all the time. 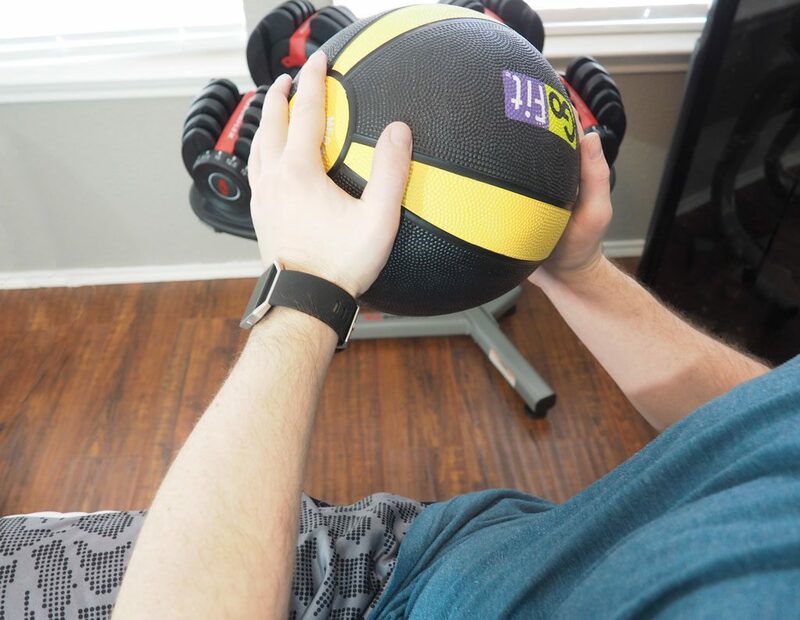 An exercise ball is great for ab work and there are a ton of different things you can use it for. 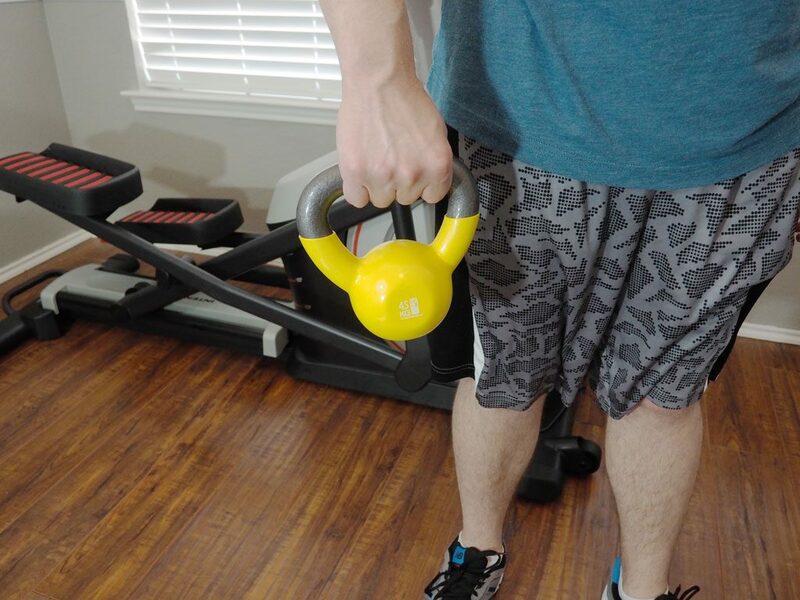 Kettle bells and medicine balls are good for strength work as well. As for cardio I plan to do a LOT of walking with the babe daily, as well as some cardio at home. But having the ability to have this home gym for under $500 and be able to work out at home when he’s napping or playing on the floor next to me is ideal! I love the options Nebraska Furniture Mart gives to create your own at home gym. Not only do they have TONS, and I mean TONS, of options and variety but the prices vary so you can really build a gym around the budget you feel comfortable with. They truly have the most amazing customer service as well. Within 5 days of ordering these items they were either shipped or delivered (a little of both). If you are wanting to create a home gym but worried it will cost a small fortune, don’t! You can create a home gym for under $500 easily! Just take a look at Nebraska Furniture Mart’s website and get started! 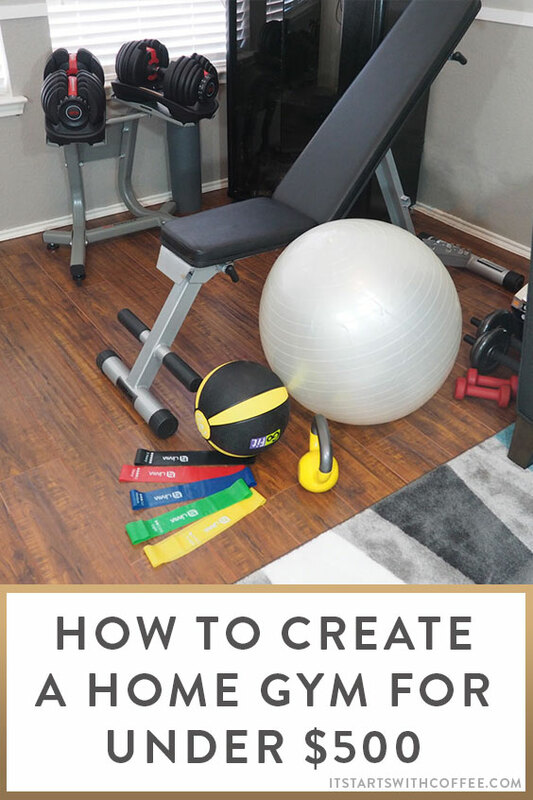 Have you ever thought about creating a home gym? Thank you Nebraska Furniture Mart for partnering on today’s post. While I was gifted the items and compensated for my time the opinions are 100% mine. How do you like those bands? 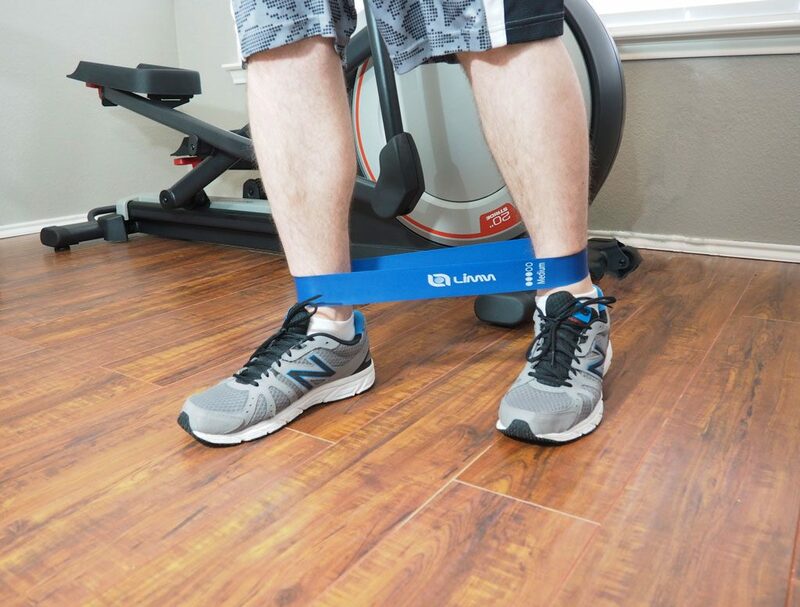 I almost ordered the exact ones from Amazon but didn’t because I have other resistance bands and wasn’t sure how much I’d use them! My husband would never go for this. He does squats and bench press. It was hard enough finding a gym (YMCA) with those types of setups (Planet Fitness doesn’t carry weights like this). Our setup would be well over $500 to put in the home! I’m moving into a place that has a “gym” but I might need to add on to it to make it more of a GYM GYM… So THIS is very helpful! I would love to have an gym at home but we just don’t have the space! I know I would definitely work out a lot more if I did! Yes 🙂 We actually already own a spin bike and some free weights. Your recommendations are awesome! Definitely something we’d reference back to when we’re ready to set things up! Having a home gym is always great to have when possible. I love using free weights and kettle bells when working out. I love this! Simple, practical, and inexpensive! I’ve been working out consistently for about 4 months, and I was looking for a few options to start building my home gym on the cheap. Thanks for this! We plan on getting a bigger home and I am totally doing a home gym area. 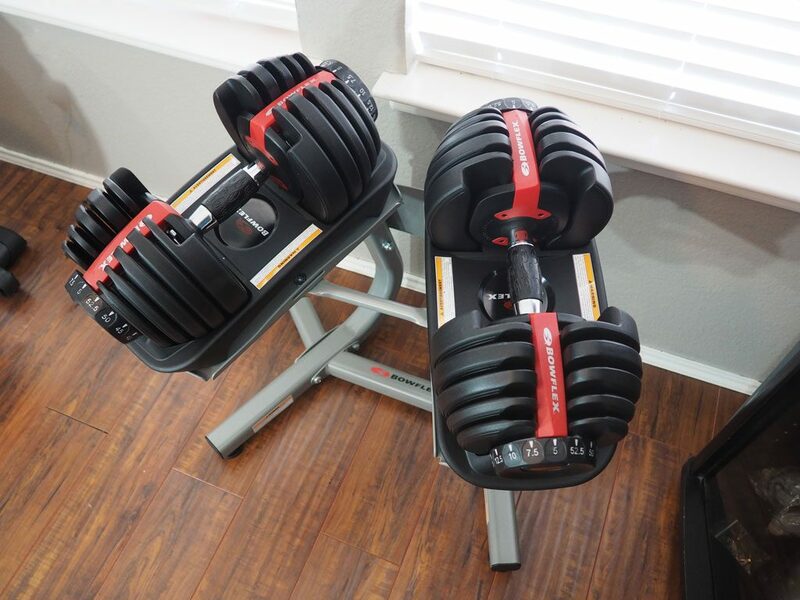 Those weights look great for both my husband and I to use. Makes it so there is not a bunch of free weights just hanging out all over the place. One of the reasons I want to move out and purchase a home. I would LOVE the option to work out from home on days when I just can’t bring myself to make it to the gym (looking at you, winter). Love that you did this for under $500–that’s impressive!! 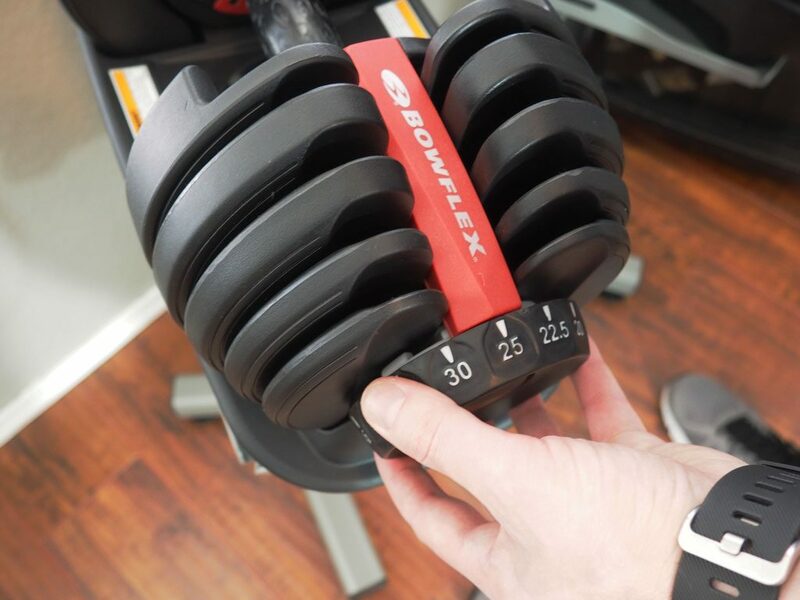 Those bowflex dumbells look awesome. Didn’t know they had them where you can adjust the lbs. Pretty cool! Those would be an awesome bday gift for the hubster! This is an awesome set up for under $500! We’ve had a home gym but later decided on a gym membership because we needed heavier weights. This is definietly a great way to get started with exercise and have the convenience of your gyme being at home. I haven’t thought about creating a home gym. I don’t life weights but those free weights are really neat, I haven’t seen ones like that before. This is awesome. I hope that when we move to a bigger place, we can have a home gym similar to this one. We honestly don’t need much! We just need the space! We have some exercise equipment at home, the problem is that we don’t get to use them that much. Haha. I will have to use them more often. I don’t feel comfortable working out in a gym, which was the reason why we got some exercise equipment. Thanks for the reminder. I’m drawing out an exercise plan tonight. Awesome suggestions. Those equipment you got will definitely give you a good work out and the cost to have them is reasonable enough. I don’t have a regular work out routine, but I do walk a lot. It just gives me so much satisfaction to be outdoors, breathing the fresh air and getting some exercise in. 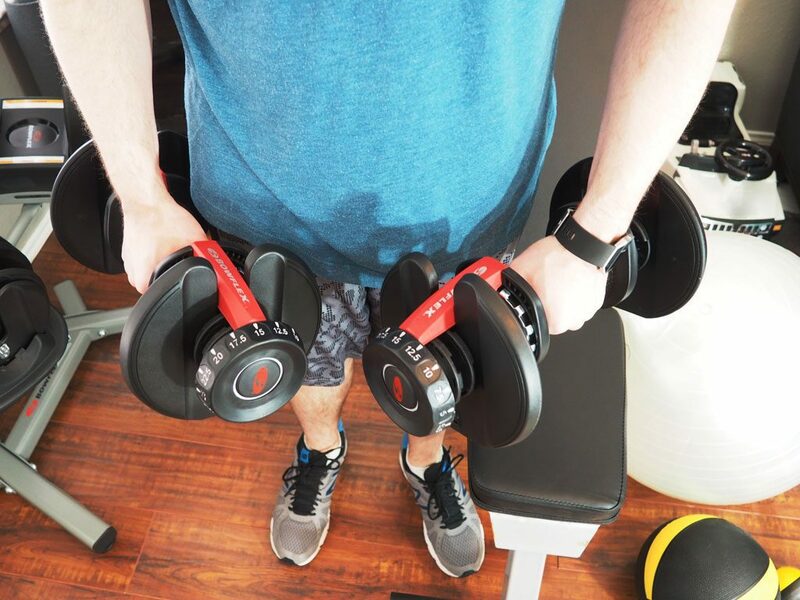 We have these weights as well and I really love them! We didn’t have much room for all different weights so these were perfect! I have a mini home gym that I love! I don’t have a gym membership, so it comes in VERY handy. Luckily my apartment complex has a gym with a treadmill, elliptical and bike, so I don’t miss a gym membership at all! Nice! That could really save a lot of money in the long run! This is something we’ve been wanting to do with our third bedroom for the longest time! This is a great how-to! I don’t have a gym at my apartment because there’s not enough space but I go to the gym 5x a week these days and it’s been nice. Maybe we will get a home gym when we get a house. Great read! I’ve always imagined setting up a home gym to be really expensive. But this seems doable and well worth the investment. This is great! My husband and I were just saying we need to cancel our gym membership. Great suggestions. I have a few items for at-home but actually re-joined a gym a couple months ago! 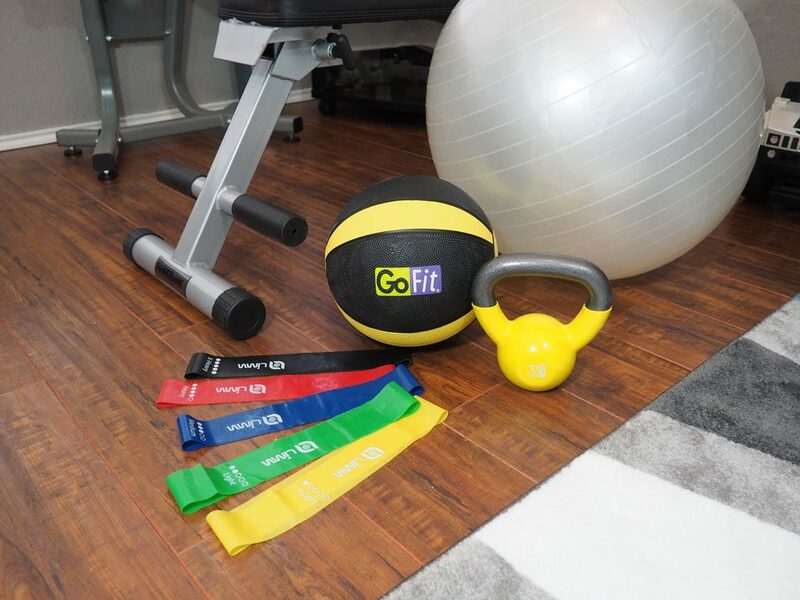 This is the perfect mix of workout equipment to have a full workout at your own home! Love it! Love all of this equipment! Great for a small space! These are really great picks! I LOVE resistance bands. I use them all the time in my group ex classes. I even have them at home! I used to have an elliptical but it never got used. I am just glad that I only paid about $40 for it so I didn’t feel bad getting rid of it. wow this is great, i wish i had space for a home gym! I will not go to the local gym! I do not like working out in front of others. This would be the perfect solution to get my body moving. These are such great tips! You’d never guess that you could really create an awesome space like this all for under $500! I love it! Your article is really nice.I am also workout in my house, It contains a lot of knowledge and information about creating a home gym. I also want to be fit.I suggest you that you can use Life Extension supplement which helps you make body slim and fit.I also use this product and it really works.I recommend you to try it once and share this information with your friends. I’ve had a home gym before and used it well. Nowadays, I really look forward to going to the gym to be with others. I love your equipment. I usually do kinesthetics for my workouts. I love using my body weight to get it done.! I have never really thought about making a home gym. I have, on occasion bought ind weighs and resistance bands–then proceed not to use them! !